Previously, to ensure that services were able to discover and connect with each other, you had to configure and run your own service discovery system or connect every service to a load balancer. Now, you can enable service discovery for your containerized services with a simple selection in the ECS console, AWS CLI, or using the ECS API. Recently, we proposed a reference architecture for ELB-based service discovery that uses Amazon CloudWatch Events and AWS Lambda to register the service in Amazon Route 53 and uses Elastic Load Balancing functionality to perform health checks and manage request routing. An ELB-based service discovery solution works well for most services, but some services do not need a load balancer. This entry was posted in AWS, Cloud, Computer, DNS, Murmuring, Network, Service and tagged amazon, api, auto, aws, cloud, console, container, discovery, dns, ecs, elb, lambda, naming, route53, service on March 24, 2018 by Gea-Suan Lin. Amazon Elastic Container Service (Amazon ECS) and AWS Fargate are now included in the Amazon Compute Service Level Agreement (SLA) for 99.99% uptime and availability. This entry was posted in AWS, Cloud, Computer, Murmuring, Network, Service and tagged agreement, amazon, aws, cloud, compute, container, ecs, elastic, fargate, level, service, sla on December 10, 2017 by Gea-Suan Lin. Amazon EKS is available in Preview. We look forward to hearing your feedback. Fargate isolation is at the cluster level. Apps running in the same cluster may share the underlying infrastructure, apps running in different clusters won't. A customer creates a cluster on their account. You as a customer can create one or more Fargate clusters on your account to launch your containers in. Fargate is definitely more expensive than running and operating an EC2 instance yourself, but for many companies the amount that is saved by needing to spend less engineer time on devops will make it worth it right now, and as we iterate I expect this balance to continue to tip. AWS has dropped prices more than 60 times since we started out. I will tell you that we plan to support launching containers on Fargate using Amazon EKS in 2018. Fargate is available today in the US East (Northern Virginia) region. This entry was posted in AWS, Cloud, Computer, Murmuring, Network, Security, Service and tagged amazon, aws, cloud, cluster, container, ecs, eks, elastic, fargate, isolation, kubernetes, preview, service on December 4, 2017 by Gea-Suan Lin. Today, AWS announced task networking for Amazon ECS. This feature brings Amazon EC2 networking capabilities to tasks using elastic network interfaces. This entry was posted in AWS, Cloud, Computer, Murmuring, Network, Security, Service and tagged amazon, aws, awsvpc, cloud, container, ecs, elastic, eni, group, interface, mode, network, port, security on November 18, 2017 by Gea-Suan Lin. AWS Batch uses Amazon ECS to execute containerized jobs and therefore requires the ECS Agent to be installed on compute resources within your AWS Batch Compute Environments. The ECS Agent is pre-installed in Managed Compute Environments. This entry was posted in AWS, Cloud, Computer, Murmuring, Network, Service and tagged amazon, aws, batch, cloud, container, docker, ecs, instance, tokyo on June 17, 2017 by Gea-Suan Lin. 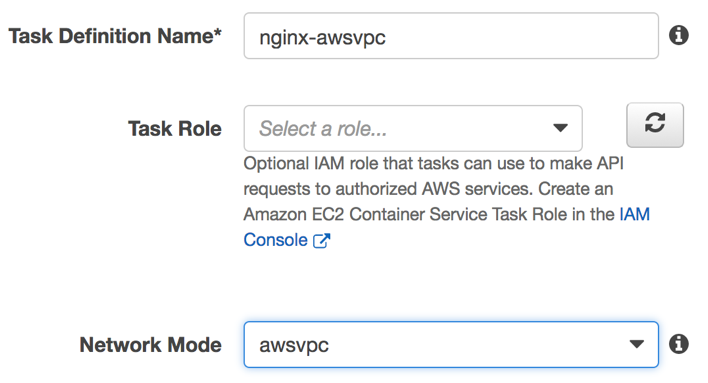 Previously, you could start and stop Amazon ECS tasks manually, but running tasks on a schedule required writing and integrating an external scheduler with the Amazon ECS API. Now you can schedule tasks through the Amazon ECS console on fixed time intervals (e.g. : number of minutes, hours, or days). Additionally, you can now set Amazon ECS as a CloudWatch Events target, allowing you to launch tasks by using CloudWatch Events. This entry was posted in AWS, Cloud, Computer, Murmuring, Network and tagged amazon, api, aws, cloud, console, cron, docker, ecs, event, job, lambda, task, time on June 12, 2017 by Gea-Suan Lin.